There are super heroes who are as fast as a cheetah, as strong as an elephant, as light as a bird and as powerful as a rhino. But there's only who's all of these and more! Originally from Africa, Mari McCabe's (voiced by Megalyn Echikunwoke) parents were killed by local greed, corruption, and wanton violence. But the orphaned Mari refuses to succumb to the terrors surrounding her. Inheriting her family's Tantu Totem, Mari can access the powers of animals—anything from the super-strength of a gorilla to the speed of a cheetah. As Vixen, she fights valiantly to protect the world from the threats like those that claimed her family. 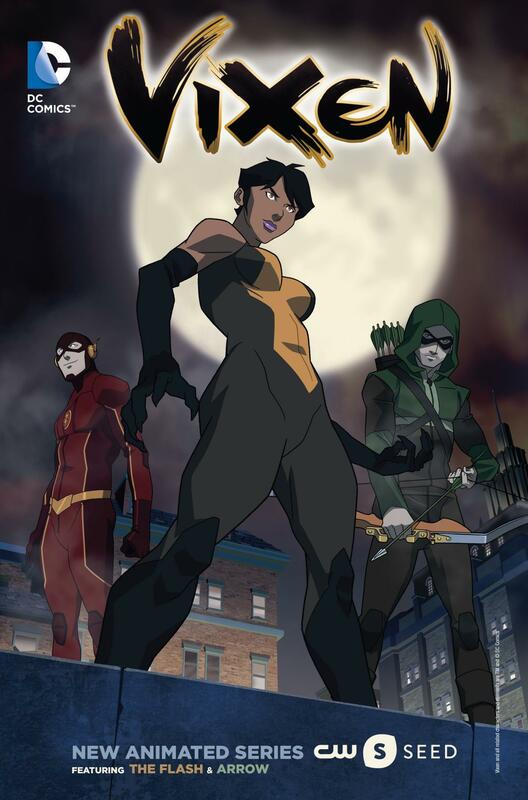 Vixen Season 1 debuted on August 25, 2015 on The CW's online streaming platform, CW Seed. Season 2 debuted on October 13, 2016. Each season consisted of six shortform episodes, running between four to nearly seven minutes in length. Vixen is produced by Blue Ribbon Content and is based on DC characters. Executive producers are Greg Berlanti (Arrow, DC's Legends of Tomorrow, The Flash, Supergirl), Marc Guggenheim (Arrow, DC's Legends of Tomorrow) and Andrew Kreisberg (Arrow, DC's Legends of Tomorrow, The Flash, Supergirl). James Tucker (DC Universe Original Movies, Batman: The Brave and the Bold) is the producer; Tucker and Curt Geda (Beware the Batman, Batman Beyond) are the directors. It was written by Wendy Mericle (Arrow), Keto Shimizu (Arrow, DC’s Legends of Tomorrow), Brian Ford Sullivan (Arrow), Lauren Certo (The Flash), Nolan Dunbar (Arrow), Sarah Tarkoff (Arrow) and Marc Guggenheim, with Guggenheim and Shimizu serving as story editors. Select coverage of this series is available at The World's Finest. Vixen and related characters and indicia are property of DC Comics and WB, 2001 - 2017. The World's Finest and everything relating to this site - copyright, 1998 - 2017.